Christ’s Coming From the East–Today, we are going to see another prophecy of Jesus’ coming for the second time. Through the prophecies of “clouds” and “fig tree” we come to understand that he must appear as man in the flesh after World War 2. Today, let us find out the prophecy of the place he was to appear according to the prophecies. According to Matthew 24, his appearance is prophesied as “lightning coming from the east.” Prophesying about the appearance of many false christs, Jesus Christ revealed about his own coming like this. Matthew 24: 26 “So if anyone tells you, ‘There he is, out in the wilderness,’ do not go out; or, ‘Here he is, in the inner rooms,’ do not believe it. 27 For as lightning that comes from the east is visible even in the west, so will be the coming of the Son of Man. Here he foretold his second coming to the lightning coming from the east. Then what is the meaning of this prophecy? As we have already seen in other prophecies such as fig tree and clouds, lightning does not mean the literal lightning either, but a parable. 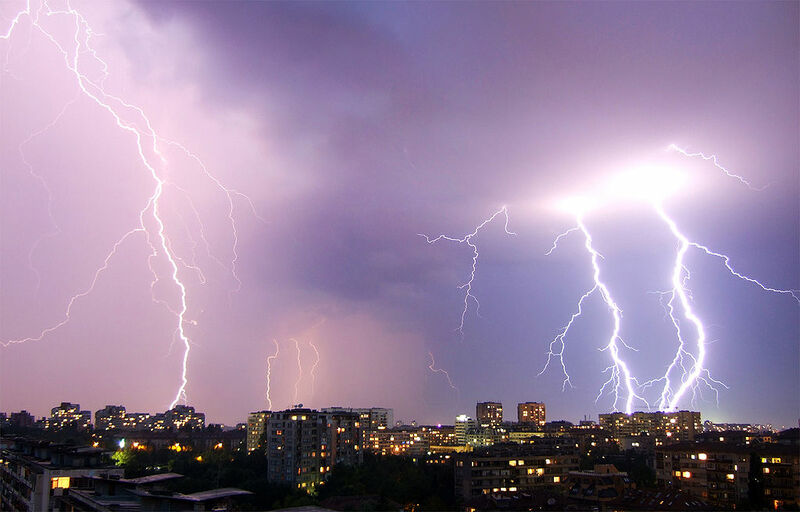 Christ’s Coming From the East–Then what is the meaning of lightning? Let us look up the word “lightning” in a dictionary to find out the meaning. According to this definition we can see some characteristics of lightning: brilliance, speed, short duration, cloud. The most important feature is in its brilliance or brightness. Lightning is a very bright light. Therefore, to know the lightning, we have to know the parabolic meaning of light in the bible. So the meaning of this prophecy is the second coming Christ would appear in the clouds (coming in the flesh) bringing the bright light (the true words of God). And the gospel of the second coming Christ will spread out swiftly and instantly all throughout the world starting from the east reaching to the west during a short period of time. Through this prophecy, God let us know the gospel of the second coming Christ will be completed quickly and swiftly all throughout the world. What is the lightning in the bible? Just like everything else, the lightning is also a parable. Then what is the meaning? Christ’s Coming From the East–Then what is the meaning of coming from the east? Since it is the second coming Christ himself who brings the words of God (lightning), “lightning from the east” means that the Second Coming Christ himself will come from the east where the light comes from. We can confirm this with many other prophecies of the bible. In many places, God foretold that the Christ would appear in the east in the last days. First, let us look at a prophecy from Revelation. Revelation reveals that the Christ will appear in the east in the last days. This is a prophecy about the appearance of the Second Coming Christ with the seal of God to protect God’s people from disasters and destruction. Since this is the seal of God, the only one who can bring this seal is God or the second coming Christ himself. We can confirm this through a mated verse in Matthew. Before the appearance of the angel with the seal of God, we can see many signs. Revelation 6:12 The sun turned black like sackcloth made of goat hair, the whole moon turned blood red, 13 and the stars in the sky fell to earth, as figs drop from a fig tree when shaken by a strong wind. We can see the signs in the sun, moon, and stars. After these signs, an angel with the seal of God appears and gathers God’s people by putting the seal on their foreheads before the coming of a great disaster (four winds) which will destroy “the land or the sea or the trees.” It means this is the last disaster which has power to harm everything except for those who received the seal of God. Christ’s Coming From the East–Then who is this angel coming from heaven with the seal of God? In the Book of Matthew, Jesus already gave us the answer for this question. Matthew 24:29 “Immediately after the distress of those days “‘the sun will be darkened, and the moon will not give its light; the stars will fall from the sky, and the heavenly bodies will be shaken.’ 30 “Then will appear the sign of the Son of Man in heaven. And then all the peoples of the earth will mourn when they see the Son of Man coming on the clouds of heaven, with power and great glory. 31 And he will send his angels with a loud trumpet call, and they will gather his elect from the four winds, from one end of the heavens to the other. In this teaching of Jesus, we can see the same signs in “the sun, moon and the stars” as we have seen in Revelation. After these signs, the Revelation said that an angel would come with the seal of God to give God’s people protection from the four winds (the last tribulation). And in this prophecy, Jesus teaches that the Son of Man (the Second Coming Christ) will come and gather “the elect” (God’s people) to protect them from the four winds (the last disaster). Through this prophecy we can see that the angel with the seal of God in Revelation is actually the Second Coming Christ himself. But according to the prophecy, where is the angel coming from? The angel appears from the EAST, which means the second coming Christ will come from the east. Isaiah 46:11 From the east I summon a bird of prey; from a far-off land, a man to fulfill my purpose. What I have said, that I will bring about; what I have planned, that I will do. In this book of Isaiah, God foretold that he would call a man from the east to accomplish his will. Many knows that this prophecy was fulfilled by King Cyrus, the King of Persia. Just like other prophecies of the bible, however, this fulfillment by Cyrus was just a copy and shadow given as example for the reality which would be accomplished by Christ. We can easily confirm this by understand the will of God for this man from the east. What mission was entrusted to him? Isaiah 46:13 I am bringing my righteousness near, it is not far away; and my salvation will not be delayed. I will grant salvation to Zion, my splendor to Israel. Christ’s Coming From the East–The reason for the calling of the man from the east is for the glory of God, that is, the salvation for God’s people. The only one who can bring salvation to the people of God is God himself. But in this prophecy God teaches he will summon a man, which means God himself will appear as man in the flesh to bring salvation to his people. Therefore, this is the prophecy of the appearance of Christ as Savior. This was partly fulfilled by Jesus Christ 2000 years ago. But there is one part in this prophecy which cannot be explained by Jesus Christ. Isaiah wrote this prophecy in the land of Israel. Jesus also appeared in the land of Israel. However, this prophecy says that the Christ will appear “from a far-off land in the east”. Jesus did not come from a far-off land in the east. Therefore, we can conclude that this is a prophecy about the appearance of the Second Coming Christ who will appear in the east. Christ’s Coming From the East–Let us take a look at another prophecy of Christ’ coming from the east in the Book of Isaiah. Isaiah 41:2 “Who has stirred up one from the east, calling him in righteousness to his service? He hands nations over to him and subdues kings before him. He turns them to dust with his sword, to windblown chaff with his bow. This is also a prophecy of calling a man from the east. Then who is this man who God calls to do the will of God? To understand this man, first let us look at the mission God entrusted to him. Isaiah 41:17 “The poor and needy search for water, but there is none; their tongues are parched with thirst. But I the Lord will answer them; I, the God of Israel, will not forsake them. 18 I will make rivers flow on barren heights, and springs within the valleys. I will turn the desert into pools of water, and the parched ground into springs. What happens when the man of God appears? The parched and dried lands are quenched with the spring of water or living water. Then who can bring the living water that gives life in the barren land? It is only the work of God. Since a man was called to do the work of God, we can call him Christ, who is God the Savior coming as man in the flesh. However, according to this prophecy, where is the Christ coming from bringing the living water? He is coming from the east. As we have already seen, above, this prophecy does not match with the appearance of the first coming Christ because he came in the land of Israel where Prophet Isaiah wrote this prophecy. Jesus Christ did not come from the east. Therefore, we can conclude that this is also a prophecy of the Second Coming Christ. Christ’s Coming From the East–In Revelation John saw an angel coming from the east from the rising of the sun with the seal of God. John saw this vision from the Patmos Island in Greece. And Isaiah wrote about a man called by God coming from the east from a far-off land to bring the salvation (living water) of God. And Jesus also foretold that he would come like lightning from the east. Then where is this land of the prophecies of the bible? We have to know this place prophesied in the bible because Christ was to appear for the second time in this land, a far-off land in the east. If we look at the map of the world, we can see many different countries located on the east side of the Patmos Island and the land of Israel. To fulfill the prophecies of the Bible Christ Ahsahnghong appeared in the land of Korea, a far-off land in the east. Korea is truly a far-off land in the east seen from the Patmos Island and Israel. It is the land of the rising of the sun. Even though there are many eastern lands and countries in the east of Israel, why then is it Korea where the Second Coming Christ appeared? It is because of the other prophecies Christ Ahnsahnghong fulfilled. In a vision, John saw a angel coming from the east from the rising of the sun with the seal of God. He saw this vision while he was exiled in the Patmos Island. And Isaiah saw a man coming from the east bringing the salvation. And he saw this vision from the land of Israel. Then where is the land in the east where the Christ is coming from? Christ’s Coming From the East–Christ Ahnsahnghong came in the land of Korea to fulfill the prophecy of the man coming from the east. Also he appeared as man in the flesh to accomplish the prophecy of coming on the clouds. And he started his ministry in 1948 to fulfill the parable of the fig tree. For these and many other reasons we can clearly see who the man Ahnsahnghong is. Even though he came as man, in reality he is God himself who has come to fulfill all the prophecies of the bible. Moreover, there is one more prophecy of the Second Coming Christ, that is, the parable of hidden manna. Through this prophecy God teaches us the true sign of the Second Coming Christ by which we can recognize him. In the next article I will show that Christ Ahnsahnghong is the true second coming Christ who came to fulfill all the prophecies of the bible. This entry was posted in Christ Ahnsahnghong, the True Prophet, Teachings Of Christ Ahnsahnghong and tagged A Man from the East, An Angel from the East, An Angel with the Seal of God, An Eagle from the East, Christ's Coming From the East, Jesus' Coming From the East, Korea, Sign of Christ's Coming, The Land of Israel, The Land of Korea, The Land of Morning Calm, the Land of the Prophecies, The Land of the Prophecies of the Bible, The Land of the Rising of the Sun, The Patmos Island. Bookmark the permalink. Christ Ahnsahnghong came to Korea to bring the the truth of life, the Passover according to the prophecy of the Bible that Christ would come in a flesh from the East. Thanks to God the Father. According to the prophecies of the Bible, the 2nd Coming Christ is to appear from the east. How can we recognize Him? He should bring the Passover of the New Covenant with Him as a sign. Only Christ Ahnsahnghong fulfilled all prophecies of the Bible regarding the 2nd Coming Christ. I saw the revelation several times but I never knew this. I always curious about savior in this last ages. Today I clearly understand who is our savior and where come from. This is the truely good news for us those who waiting for 2nd coming Christ. I’d love to share this message whole world. I give all thanks Christ Ahnsahnghong has come a second time in flesh to save us. When I learned for the first time the prophecies about the place where the Second Coming Christ was to come, I was overwhelmed and thrilled so much. While reading this article, also I’m still thrilled. I cannot but to say that Ahnsahnghong is the true Christ who is to come a second time for our salvation in this last day. How amazing it is! The Bible exactly testifies about the place of Second Coming Jesus’ coming that is the east. And Second Coming Christ Ahnsahnghong restored all the truth for our salvation. Only God can do it. Our sins demanded the sacrifice of our father, Christ Ahnsahnghong, in this earth. I give thanks and glory to Christ Ahnsahnghong who came as a man to lead us to the way of the Kingdom of Heaven. He must be our savior coming from the east according to the prophecy. Bcus Only through the seal of God, the Passover of the New Covenant which Christ Ahnsahnghong brought back, we can get the promise of salvation. 2nd coming Christ came to South Korea where the Bible testified that the Savior would come. God gives us many hints to make us acknowledge him as God on Bible. I found out many prophecies which testify about Christ Ahnsahnghong is our savior through Bible. It was amazing while I studying about him on bible. Oh, It’s so amazing that Second Coming Christ must come from the east! And Korea where Christ Ahnsahnghong appeared is really a far-off land in the east from the Patmos and Israel. Wow… the prophecy is perfectly fulfilled. Amen~! It is truly said that Christ Ahnsahnghong who brought us back the New Covenant Passover which is the only way of salvation is the Second Coming Christ !!!! When God prophesies about something, it is to fulfill it. So it is not strange that He comes to Korea for the salvation of mankind according to the prophecy of coming from the east. Christ Ahnsahnghong is the only one who come down the earth for our salvation and take the Kingdom of heaven. According to the bible, he is going to come to the east side and bring the Passover. Korea, human, the Passover…….. only Christ Ahnsahnghong can saver us. Thanks to god the father. God has informed you by the Bible’s prophecy of the time and place in which you will appear again. Salvation depends on our attitude of faith in looking at the prophecy. This article helped me a lot to understand that God would come to this earth as a man a second time, and be born in Korea. It is so much surprising to me though. I think so too. It’s awesome! Thanks to Father Ahnsahnghong forever. Very clear and detail explanations of 2nd coming Christ! How cannot we meet Him! Thank you for granting all the clues for God’s children! Who can teach this mysterious truth about Christ? It is very important teaching for our salvation. Israel committed a great sin of not accepting Christ because he could not believe the prophecy of the Bible. God once again shines the light of salvation on a far-off land in the east. Mankind should be careful not to make the same stupidity by teaching history. Just as Jesus came to Bethlehem in the Old Testament, the place where Second Coming Jesus Christ will come is prophesied as the eastern tip of the earth. When I give up my thoughts and stubbornness, the prophecies of the Bible come to me by faith.